Tripper - Because everyone hates doing the travel expense reports - Businessangels.fi - muutakin kuin rahaa. Travel expense management is a manual process and a pain in all Western countries. Both end users and accountants waste a lot of valuable work hours to process travel expense claims. Current travel expense management solutions still require a lot of manual typing and descriptions. Many companies have tried to solve the problem. Improvements have mainly addressed the transforming old time consuming practices to the web. 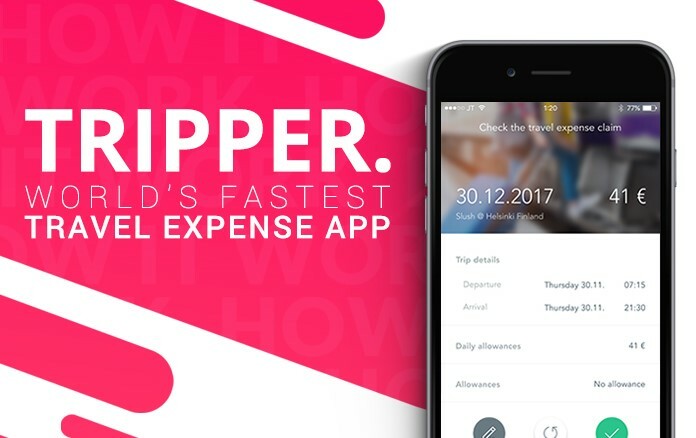 Tripper automatically completes the travel expense report for the user. Tripper’s Artificial Intelligence analyzes the user’s calendar and calculates mileage and per diems automatically. Tripper can also solve over 85 % of all paper and e-receipts automatically i.e. get all the item names, prices, vat rates and accounts and create accounting entries automatically. These allow users to complete travel expense reports without writing anything – all can be done in less than 5 seconds. We have validated our service with direct customers and we are growing our sales through partnering with financial software and accounting companies. Currently we take 50 cents per receipt/trip. Tripper was launched in October 2017 and since then we have acquired ~200 users. Tripper is the winner of New Factory Startup Program 2017 and Startup Garage.